Leading Public Sector Unit Bharat Sanchar Nigam Limited (BSNL) has announced the launch of new Prepaid plan under GSM mobile services as promotional basis. State run Telecom Company BSNL introduces ‘Kerala 446 Plan’ exclusively for Kerala circle Prepaid customers which offers both voice calls and data usage benefits from 20th October, 2017 onwards. As per latest information, BSNL Kerala Circle through Kerala Plan 446 offering True Unlimited voice calls to any network even in Roaming and 1GB free data usage per day with 84 days validity. 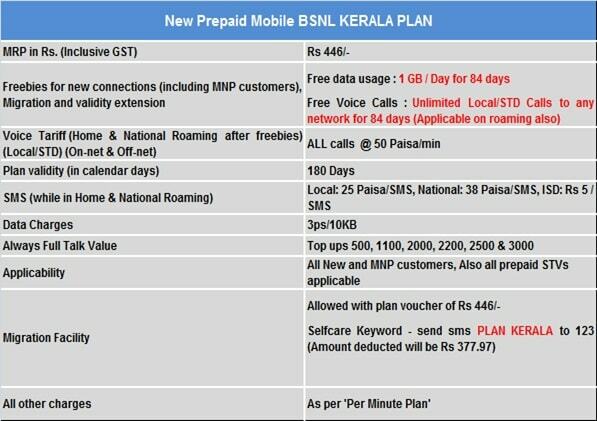 Kerala plan 446 initial validity is 180 days and outgoing voice calls for Home and National Roaming after freebies (Local/STD) @ 50 paisa per minute for Off-net/On-net. Similarly for SMS, Local @25 ps/SMs, National @38 ps/SMS, ISD Rs.5/SMS. In addition on recharge of Topups Rs.500, Rs.1100, 2000, Rs.2500 and Rs.3000 BSNL offering always Full talk value. This plan is applicable for new and MNP (Mobile Number Portability) customers and all prepaid STVs allowed under this plan. Prepaid user can activate 446 plan by sending SMS to 123 through self-care method in the format PLAN KERALA (amount deducted from the main account balance). The above plan will be implemented with effect from 20th October, 2017 and available upto 90 days on promotional basis across Kerala circle. All other charges as per ‘Per minute plan’ and terms conditions will remain the same.